Looking for an original gift idea for him? Discover Nomination’s jewellery collections for men! 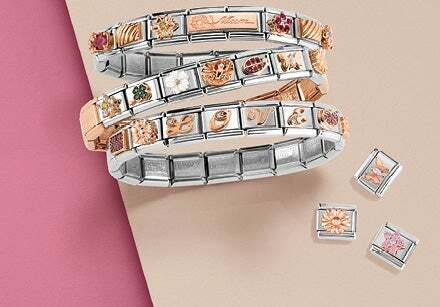 You’ll find bracelets, watches, rings, key chains and cufflinks made of top quality materials like stainless steel, sterling silver, brass and leather, decorated with enamel and gemstones. 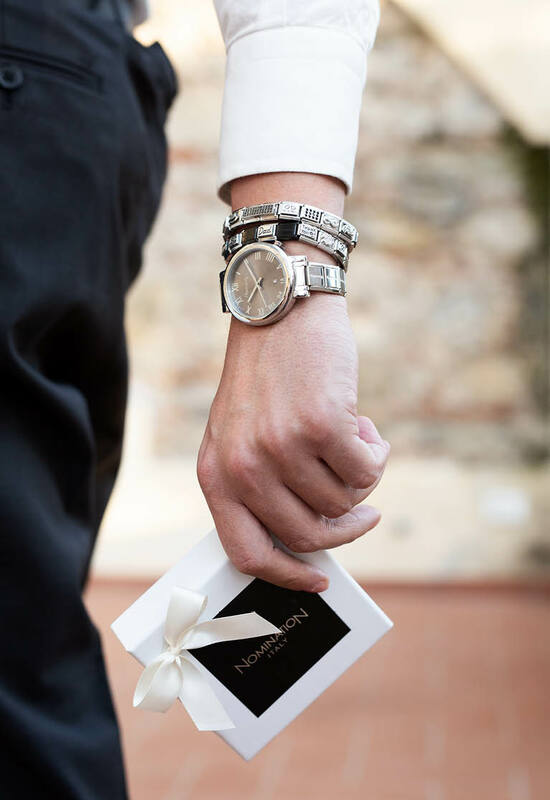 All of Nomination’s men’s jewellery is guaranteed by the Made in Italy seal: synonymous with long-lasting high quality for a gift that’s forever. Among the many accessories for men and boys you’re sure to find exactly what you’re looking for: Nomination collections include both classic and elegant jewellery, along with more informal options suited to the casual moments of everyday life. To each his own jewel: our selection of men’s jewellery includes gift ideas for your boyfriend or husband, but also for a brother, a son or a good friend. Want to get a truly original gift for your guy? Then the right accessory is a customisable Composable bracelet: with Nomination Links and charms decorated with letters and symbols for every occasion, you can make a unique bracelet that’s just for him. Among our jewellery gift ideas for him you’ll find many Links that are perfect for celebrating each moment: from those in gold with engravings dedicated to your dad and grandfather, to the most romantic Links, perfect as an anniversary gift. Alternatively, we also have many Composable bracelets already assembled which are dedicated to different themes and occasions, to celebrate a trip, your passions or your love story. A metal engraving you can take with you everywhere is the most romantic gift idea there is, perfect if you’re looking for something special for your boyfriend or husband to celebrate an important occasion. 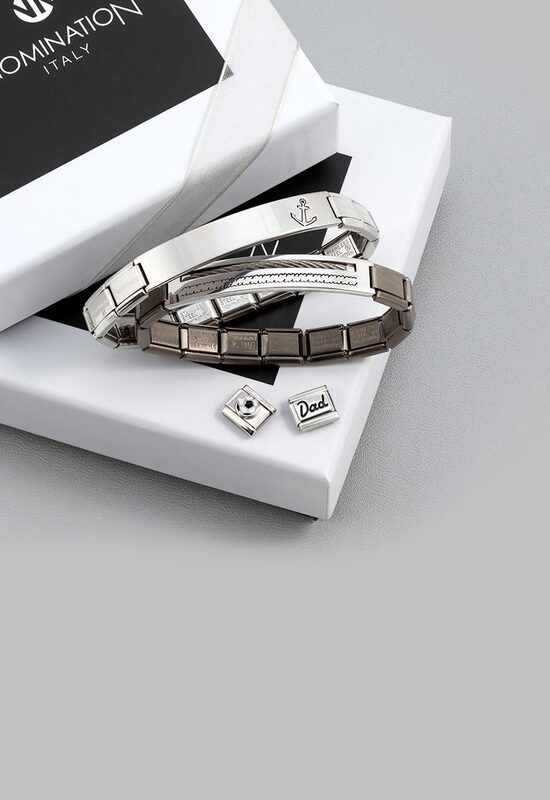 In our selection of men's jewellery you’ll find several stainless steel accessories to customise with your very own engraving: a name, an important date, a romantic saying. Choose a Trendsetter bracelet in stainless steel, one of the Montecarlo or Metropolitan pendant necklaces, or a key chain in stainless steel and enamel. 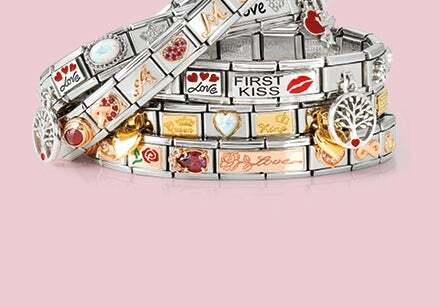 Each of these accessories will be engraved on the back with your words, to keep your precious message alive forever. Great care should be taken when choosing a gift for a friend, a brother or someone special. We’ve prepared a selection of jewellery that’s the perfect original gift for every occasion. Among the accessories dedicated to him, there are key chains and cufflinks, details that enrich a man’s look and enhance his strong personality. A great classic among men’s gifts is the watch: among our selection you’ll find both casual versions, with a coloured silicone or two-tone fabric watchstrap, and those with a stainless steel wrist strap that that can be personalised with Composable Links. Last but not least, choose sunnies from the Sunglasses Collection if you think the perfect gift for your man is a fashionable accessory that perfectly protects your eyes during the sunniest days: even Nomination sunglasses are 100% Made in Italy.